A good proportion of the support calls we receive from payroll staff on PayDay are queries about the calculation of PAYE, USC, PRSI and LPT because employees are asking them for explanations. In light of this, Ardbrook decided to introduce a nice neat feature to make life easier for payroll staff and, by extension their employees by providing a comprehensive breakdown of how these statutory deductions are calculated. This breakdown is available to payroll staff by clicking on the [Show Calculation] button on the calculation screen and, if required, a plain paper printout can be produced to give to the employee. 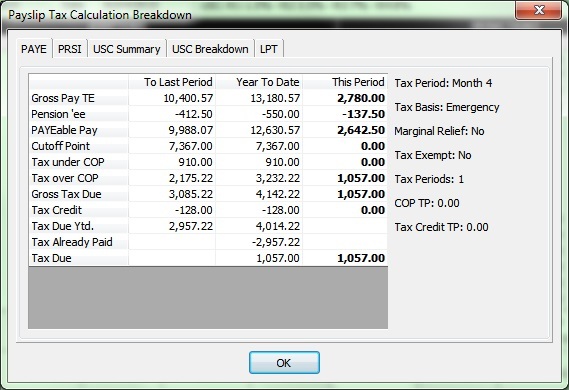 As you can see in the sample screenshot below this is a tabbed screen with an individual tab for PAYE, PRSI, USC Summary, USC Breakdown and LPT. Just click on the [File] option on the Main Menu Bar and on the subsequent dropdown select [Software Update – Internet] and the [Software Update Wizard – Internet] will guide you through the installation.